John Sack has a BA in English from Yale University and an MA in Creative Writing from the University of Washington. 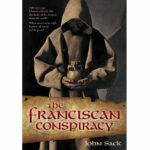 The Franciscan Conspiracy is his first adult novel, although he has previously published computer textbooks and a young adult novel. In the 1980s he wrote a young adult historical fiction novel called “The Wolf in Winter” about the life St. Francis. In addition, he’s authored many computer books and worked as a technical writer and editor through his business, Cyberscribe. Sack has spent a couple years studying at Our Lady of Gethsemane, a Trappist monastery in Kentucky. He later trained in Swami Muktananda’s Hindu ashram in Ganeshpuri. Now in retirement, he continues to explore spiritual themes and fiction. He currently lives in Southern Oregon.